Terrorists struck a second Israeli vehicle near Eilat barely an hour after an initial ambush on an Egged bus on Route 12 near the city. A second Israeli vehicle was targeted early Thursday afternoon by unidentified terrorists who apparently fired a rocket-propelled grenade (RPG) that scored a direct hit on the road to Eilat. At least five passengers were critically wounded in the attack. Magen David Adom medics on site continue to treat the casualties who are fighting for their lives. Yoseftal Medical Center in Eilat currently reports that 33 casualties were admitted to the center. Of those, however, five were subsequently flown to Soroka Medical Center by helicopter for advanced treatment. The attack occurred less than an hour after a terrorist cell ambushed a bus on Route 12 to the Red Sea resort city, aiming automatic gunfire at the vehicle and wounding seven passengers. Highway 12 connects Ovdat Air Force base and Ovdat airport with Eilat. The airport and the base are adjacent to each other. Security sources said the bus appeared to have been hit by fire apparently from the Egyptian side of the border, in the Sinai Peninsula. In addition, a military vehicle was struck by a roadside bomb near the security fence along the southern border, sources said, wounding its passengers. Egyptian authorities insisted that the attacks must have been fired from Israeli soil because "it is impossible to shoot Israelis from the Egyptian side." Israeli sources pointed out that it was a laser-guided anti-tank missile fired from Gaza toward the Saad Junction that killed a 16-year-old Israeli-American boy in a terror attack on a school bus earlier this year -- "a distance of about a mile if not more." IDF soldiers who were passengers and police who raced to the scene engaged in a firefight with the three terrorists who had attacked the first bus about 30 kilometers, some 12 miles northwest of Eilat. 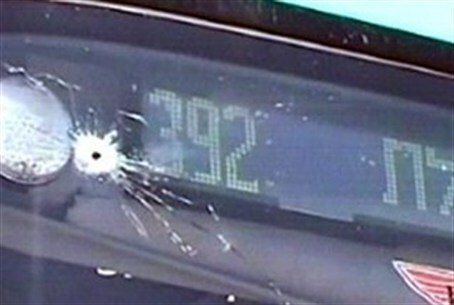 At least two of the three terrorists responsible for the ambush on the first bus were confirmed killed in the firefight. The third has allegedly been critically injured.